BEAM Professionals (BEAM Pro) are green building professionals accredited by the Hong Kong Green Building Council in various aspects of the green building life cycle. The key role of BEAM Pro is to integrate the latest green building standards and practices into everyday building planning, design, construction and operation. BEAM Pro will be responsible for advising the project team on achieving the required credit to attain the client’s desired green building rating level. Effective from 2017, candidates must complete the 1.5-hour Fundamental Course as a prerequisite before enroling in the Elective Course of NB – BEAM Plus New Buildings, EB – BEAM Plus Existing Buildings, BI – BEAM Plus Interiors and ND – BEAM Plus Neighbourhood. Upon successful completion of the Fundamental Course, candidates will be eligible to opt in to any of the elective courses within two calendar years upon completion of the Quiz of Fundamental Course. b) Experience and knowledge by proving involvement in BEAM/BEAM Plus projects under which the applicable rating tool is used. III. To complete the Online Fundamental Course, candidates are required to watch the online training video, complete the feedback form, and achieve a score higher than or equal to 70% to pass the quiz. V. Candidates failing to complete the online quiz within 10 calendar days will have to re-enrol in the fundamental course in full payment of $1,000. Only online registration via the Online Training Portal is accepted. Registration fee would be HK$1,000. Please refer to the Instruction for Registration. In order to complete your application, you must provide ALL of the following documents, otherwise the application may not be entertained. A minimum of 5 years postgraduate experience related to the assessment of green buildings, or equivalent. A minimum of 5 years postgraduate experience related to the assessment of green buildings / interior design or interior fit-out, or equivalent. A minimum of 5 years postgraduate experience related to the assessment of green buildings or equivalent. Only online registration via Online Training Portal is accepted. Applicants will receive an acknowledgement email for the application from BSL within 24 hours. Applicants will receive another email which indicates if the application is successful or unsuccessful within 7 business days. Candidates should complete their payment in due course to confirm their enrolment. Otherwise the registration is not deemed successful. Members of Supporting Organisations would be given a 10% discount of the original fee of the elective courses. Applicants must take the BEAM Pro Training and Examination as a package. Enrolment of all elective courses – Extra 20% off for the enrolment of the 4th Elective Course. The additional discount is applicable to both members and non-members. The discount is valid for 1 year starting from the date of acceptance of registration for the 1st elective course. The additional discount is NOT applicable to examination retake, resit or reschedule. BEAM Society Limited reserves all rights to revise, amend and modify these terms and conditions from time to time in our absolute discretion. The purpose of BEAM Professional Examination is to test the core concept of the aspects under BEAM Plus Assessment Tools and the knowledge to support BEAM Plus projects and green buildings in the areas of design, construction, operation and maintenance. The Examination is a computer-based test with randomly generated multiple-choice questions. The BEAM Plus Manual will be provided at the examination venue. Candidates are advised to review the BEAM Plus Manuals and training materials prior to the examination. Rescheduling of the Examination is permitted; and candidate is allowed to submit an application ONCE, if he/she cannot attend the original scheduled date of examination. The application must be submitted to BSL at least 10 business days before the original scheduled date of examination. An Administration Fee of HK$600 will be charged per application after the first confirmation email is sent to the Applicant. The Applicant will then be advised to choose 1 - 3 more option(s) when the new schedule is available (subject to seating availability). If the candidate fails to attend the examination per the new schedule, he/she is required to apply for re-siting the examination. Provisional examination result with the result of pass/fail will be generated immediately after the examination. The candidates shown as "FAIL" in provisional examination result will be informed by BSL within one month after the examination regarding the score and arragement for examination retake. An individual account will be created at the HKGBC website for each candidate passing the examination. The candidates shown as "PASS" in provisional examination result will receive the login information from HKGBC around 1 month after examination. Candidates who fail the examination can re-take the examination after paying of an additional fee each time. The fee for re-taking the examination is 60% of the standard fee per examination session, which is applied to all candidates. Payment must be completed not less than 1 week before the new date. Any candidate who is absent from the examination due to medical reason or personal issue is eligible to re-sit the examination subject to the same additional payment. The valid period of retaking the examination is limited to one year from the first Examination date of the candidate; Candidates who failed the examination within the one-year period is required to retake the BEAM Pro Training and to pay for the full payment of Training and Examination fee. Application of re-take or re-sit Examination is on a first-come-first-serve basis. Please kindly note that the next available examination retake dates for your planning: BEAM Plus (NB): 17 & 18 September 2018. Qualified re-takers are strongly advised to apply for retaking the examination as soon as possible. Examination seats are allocated on a first-come-first-serve basis. Appeal to the process, procedure and questions of the examination are accepted. Some examples of "Appeal to Process and Procedure” are the delay in allowing candidate to enter the examination centre, computer glitch, unclear instructions for the examination, etc. Candidates must provide clear and concise description of the issue under the appeal. An administrative fee of HK$500 will be charged per Process / Procedure. For appeals on examination questions, the charge would be $500 per question. Candidates must provide the question number and rough idea of the question to support the appeal. If the appeal is successful, the fee shall be refunded to applicant. Please note that appeal should be applied within 10 business days upon receiving the provisional examination result. An acknowledgement via email will be issued to the Appeal Applicant within 3 business days from the day the form and cheque are received. BSL will review the case and a reply will be issued to the Appeal applicant within 20 business days. BEAM Pro maintains his/her qualification, regardless of number of specialties he/she obtains, by paying $300 qualification renewal fee and submitting 15 CPD hours to HKGBC every year. BEAM Society Limited will organise Upgrade Training Course when there is a major revision or revamp of the BEAM Plus Assessment tool. Candidates are strongly suggested to apply for the course in order to keep pace with the most up-to-date standard for overall sustainability performance. 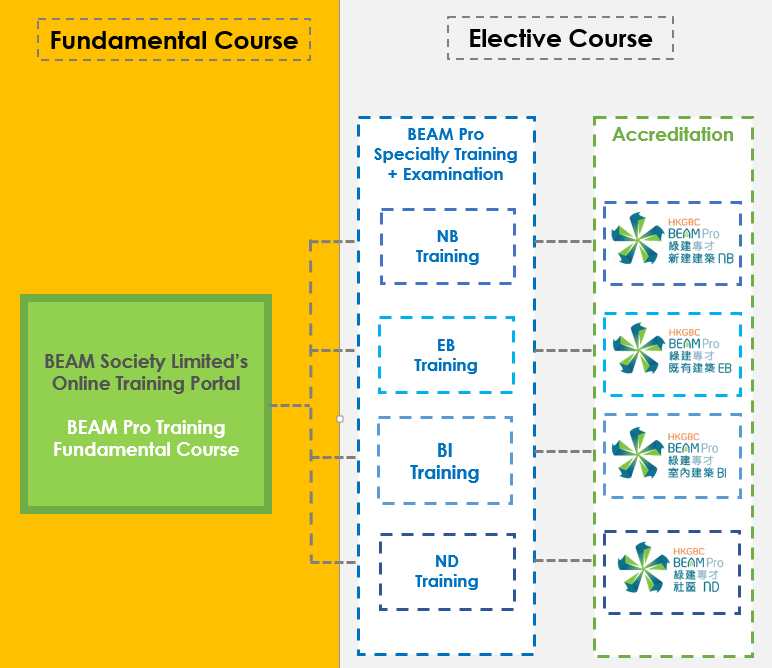 For enquiries about BEAM Pro Training and Examination / Upgrade Training Course, please contact BSL at 3610 5700 or email beampro.training@beamsociety.org.hk. The examination venue of Hong Kong Examinations and Assessment (HKEAA) provides special examination arrangements for candidates with special needs and disabilities. Please click here for details.